I write this having returned from the USA a few days ago. This season was nothing short of a massive rollercoaster ride. Both mentally and physically. I had moments of sheer adrenaline rush as I skied through tight trees, found my absolute need for speed, discovered my love for snowmobiling (more on that later), and got big air on some decent sized jumps. I also had moments of despair, feelings of isolation and anxiety as well as real doubts about myself. I went out to the States determined to 'find my fun' and to reignite the love of skiing, having become a bit despondent about it, I am happy to say that the love is definitely back, particularly for free skiing which I was fortunate enough to get a fair bit of towards the end of the season. My trip to California came at a perfect time. I had sustained an arm injury which transpired to be along the lines of 'repetitive strain injury' or 'tennis elbow' which sounds a little lame, given everything. It started as a niggling pain but as my trip approached became complete agony. I do not exaggerate when I say it is the worst pain I have ever been in (that I can remember - as that doesn't include breaking my back!) So I spent the first week in the gorgeous Carlsbad keeping sedentary, dosed up on painkillers, and trying to get through it. This experience has given me a massive amount of respect for all those suffering with chronic pain. It is often a side-effect of disability and I know a few people who really struggle with it; so often without complaining. To suffer like that was debilitating and devastating. It was really hard to get anything done and I was so lucky to be staying in a very accessible house with my friend Kalim (he rents his places out so anyone interested in staying in one of the best places on the planet, in my experience, do get in touch) who was incredibly kind, generous and thoughtful about my situation. He himself struggles with terrible pain so was very empathetic. I was given ibuprofen injections which helped, and then acupuncture too which made a big difference. The pain is much better now, although it still hurts to lift things. It was definitely time to come home when I did. So, rather than a lament for my pain, I write this as a nod of respect who all those who suffer from pain, and often in silence. Props to you guys. I spent a fair bit of time with my good friend Beth out there who has finished her ski racing career after having to have two back surgeries in a year. We have a lot in common, namely our love of skiing, but also our love of adventure and travel (as well as both being in wheelchairs, injured the same year). She came back from Bali fairly recently and had a brilliant time. I've been longing to go there for years so was interested to hear all about it. Chatting about this stuff, we both realised we wanted to do the same sort of thing. We wanted to travel and adventure, but on top of that we also wanted to share the experiences we're fortunate enough to have with the world, with the aim to inspire others and break down people's perceptions of disability. So, over coffee and breakfast burritos, Our Adaptive World was born. My absolute favourite new activity! This season I didn't race. I wasn't in the right headspace for it and feel like it would have done me more harm than good. I did, however, find my love of skiing, skied a lot and improved loads. I injured myself more than once. I battled demons, but started a new chapter of my life with Our Adaptive World. I found my new absolute favourite thing in the world in the form of snowmobiling. I went cross-country skiing. I went to San Diego and fell in love with the place once again, despite immense pain. I caught up with old friends and met some amazing new ones. After an incredible final week and a last day skiing 12 inches of powder I was sad to leave but am also glad to return home. I'm glad of the NHS right now to sort my arm, amongst other things, out and of British food! Although CA cuisine is pretty special - no offence Winter Park, but you are no culinary hotspot! A huge thank you to all those who supported me and my season. I'm sorry I do not return with some race results and I hope you understand that I had to put my head first and do what was right for me at the time. We've already written a number of blog posts about our recent adventures so please do check our Our Adaptive World. We are both really excited and have some great plans in the pipeline! We're going for the top! What a way to end the season - 12" of fresh Colorado pow! I write this from the plane to Denver – I’m flying Norwegian Air which was amazingly inexpensive - £230 before baggage etc. and I’m pleasantly surprised – there isn’t too much of a difference between this and BA (who I usually fly to the States with) so I’m very pleased. I’m really excited to get to Winter Park and to get back on snow. In December I was in Pitztal for a training camp and races, which was really good (despite the races being cancelled due to very poor conditions). My skiing felt like it had really turned a corner and felt great. We were mostly freeskiing again which is really helpful but I’m also excited to get into some gates to get me prepared for racing. I am certain that my progress can be attributed to spending quite a bit of time at Chelski – the ski centre or ‘Urban Mountain’ which I have found has been really helpful in working on my body position and dialling it in, without the other factors that skiing on a mountain often presents, like poor visability, bumps, as well as bypassing t-bars and poma lifts that can be tiring and time consuming. For anyone looking for a bit of practice before going skiing this winter I really recommend giving it a try. Check them out: chel-ski.uk. Me on my new Rossignol slalom ski at Chelski. I’m (probably understandably) feeling slightly nervous, probably due to the early morning and slightly stressful arrival at Gatwick airport. Travelling with quite so much luggage when you’re relying on disability assistance for help with the kit isn’t particularly breezy, especially as there are no porters at Gatwick airport anymore which is usually what I’d use. But thankfully someone came to help and managed to squeeze my stuff onto a buggy usually reserved for transporting people and I met him at the check in desk. As usual, I was a little worried about my luggage weighing too much (five skis + outriggers in a single ski bag!) but thankfully it was all allowed through. I now write this from my bedroom in Winter Park, I got in from skiing not long ago (third day here, third day out!) although I am taking a little time to acclimatise on the mountain. It’s very high up here so I get fatigued more easily than usual. That’ll settle soon enough though. I’ve been free-skiing so far, on the GB coach's advice, rather than getting straight into gates. I do, after all, have quite a bit of time here so am in no hurry. Especially as I intend to free-ski almost as much as train while I’m here so I can get them most out of my time here. I’m looking forward to doing all sorts of skiing here, getting better in powder, skiing some more trees (so far I’ve only skied fairly sparse tree sections which I’ve really enjoyed), as well as hitting some bigger jumps too. That, and lots of training of course. So many intentions – right now I’m in bed having sacked off my plan to go to the gym this afternoon! Better work on my stamina! It’s lovely to be back, I feel so happy here and it’s great to see lots of friends. Winter Park is a really small town so it’s much friendlier than my home city of London. There’s a coffee shop I’ll go to everyday (finding a cup of Earl Grey essential right now after a morning skiing) and it’s nice to be welcomed by name each time by the lovely staff there. Same goes with the bus driver, NSCD staff, gym staff as well as the lifties, amongst others. It’s a world away from London and I feel really lucky to be able to experience living here as well. Three days in and short on photos... this was how my first day went. Rode up on the lift, and broke an outrigger clean in half getting off the lift. Must have had a crack and been waiting to happen. Cheers to Pat in the equipment room who came to my rescue fixing one I broke last year in a flash. One thing I’ve been doing which I’ve found really helpful is journaling my experiences, partly for my skiing as a training journal, but more really for myself. It was one of my GB teammates recommendations and she finds it really helps her mental health. This ski racing business can take a toll on one’s mental health, it’s competitive obviously, but for me it actually comes from being hard on myself. It’s New Year’s Eve today and, amongst other resolutions, I’m going to work on stopping comparing myself to others so much. Each of us have our own journeys and we need to carve our own destinies! Happy New Year everyone! I returned home on Sunday from a great ten day training camp back in Hintertux in Austria. As usual we were staying at the very comfortable Kossler Hotel with the lovely Karina and her family. After arriving on Thursday, I unpacked and prepared my skis ready to go the following day. Thanks to the great guys at Rossignol, from whom I have now got a healthy racers discount, I had a new pair of slalom as well as GS skis so I was looking forward to getting going on them. Each day I woke up at 6am to get ready for activation at 6.30am. Usually I get as ready as I can the night before so I don't have to use my brain too much that early. In activation I mostly stretch out my arms and neck as these usually get a bit of a hammering and this camp was no exception. I've found that I've got quite reduced mobility in my arms so I'm working hard on that both while abroad as well as at home with the brilliant Natalie at Neurolink. Any fellow SCI's needing a bit of work on mobility/posture - get in touch with them. One of the best decisions I've made: neurophysio.london. After breakfast there's a walk to the first cable car at the base of the glacier, once there there's a bit of a wait for them to open the lift. It's important that we get there with plenty of time so we can get moving as soon as we're able. A few days in we were joined by the USA Paralympic team, quite a few of whom I know from my time spent in Winter Park, so it was fun to chat to them in the morning while we waited as well as taking the cable cars together. We also shared a training lane with them so got to ski together too which was nice. 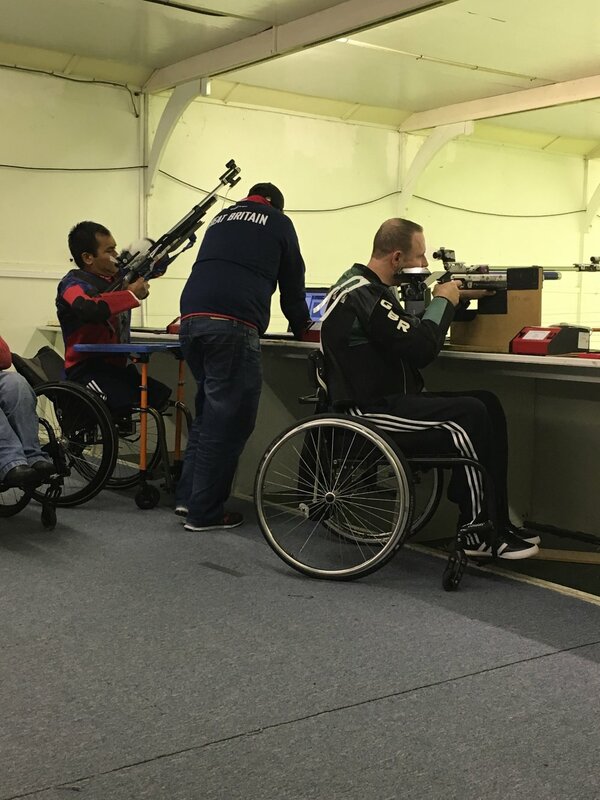 They have an A,B and C team long-listed for the Paralympics next year and the majority of all the teams were there. It was cool to be able to see and ski with some of the very best in the business, particularly the male sitting and standing class. As things ramp up for the Games next year, national teams are out in force. We were with teams from all over the world including China, South Korea, Australia and many European teams. I can't wait to watch the Games on TV next year as there will be some familiar faces to cheer on. We spent the first few days free skiing and working on individual things. I was working on rotating the ski which will give me more control over direction, as I tend to go straight in for the carve. I was quite surprised to find that rotating my body gave me the ability to rotate the ski more so that was a really helpful learning experience. My own personal challenge on this camp was to get on with my new equipment. Both skis as well as the leg fairing that I had made by Aspen Seating earlier in the year. I hadn't used it very much as I seem to have a slight issue with mixing things up and changing equipment from what I'm used to. It's an example of how much of this is mental and to do with mindset and confidence. The brand new slalom skis were stiffer than I'm used to and I took a while to get used to them, but it was definitely a step in the right direction to get on my new equipment, especially while I had the time and no pressure of a race while I was there. That was a mistake I made in Pitztal last year when I got on a new ski a few days before a giant slalom race which wasn't very successful and left we with a nice gash on my forehead. Not the confidence builder I needed before the race! The following day I got back on my old GS skis which felt great. After a few runs I switched to my new GS skis which I felt really comfortable on. I'm starting to feel the difference between different skis which is a good sign as it shows I'm using them properly. The new ones felt great and have some more life in them than my trusty Atomic skis which were bought second hand a few years ago so are on their last legs. GS is definitely my favourite discipline at the moment but I'm determined to enjoy slalom in the same way. The conditions were miles better than last time and we were blessed with good visibility and even some bluebird days. So I wasn't left pining after Colorado (which seems to have no end of bluebird days - although maybe that's just me remembering the best of days.) All in all I made some good progress, quite a bit of time was spent free skiing, which I can understand the benefits of, although it does always feel great to get back into gates, especially as races are on the horizon. As this is one of the only opportunities to train GS so the remainder of the camp was spent on our long boards. I'm looking forward to the first GS race of the season in Pitztal at the start of December. Each day we spent about 3 hours skiing in the morning before coming down in the cable car to get some lunch and then coming back down to the base where we'd head back to the hotel. It's a beautiful walk / or roll for some, back to the hotel, I always quite enjoy a solitary moment rolling back down the hill after the morning with the team. After this it's a quick change and a recovery session where we'll do stretching and generally recovery of our muscles. Then we have a few hours to ourselves to shower, rest, catch up on emails or tune and wax skis in preparation for the next day. Then at 4 or 5 we'll have a video analysis session most days and sometimes an education session following this. During this camp we had some really helpful education sessions led by coach, Lynn who was an able bodied racer, so who has a huge amount of knowledge and experience to impart. I felt like we were given a good grounding about the fundamentals of ski racing like racing line, ski racing rules as well as some of the technical aspects of skiing - with a focus on sit-skiing as there were so many of us in attendance. All in all it was a good camp and it was really nice that we didn't have to take any extra days off due to poor conditions. The more practice the better! Since I've been back I've been pretty active; skiing at Snozone in Milton Keynes, putting some time in at Chel-ski, the ski-plex which is like a treadmill for skiing. I'm finding it great for dialling in the body position and creating the right sort of angles. And also getting as much time on the water as the weather or light allows. Teammate Amber and I doing it for the girls! Next up is first race of the season - slalom at Landgraaf in Holland. I'm driving over on 4th November for a few days of training before the races start. Now I've recently taken delivery of my British Parasnowsport team kit too I'll be wearing it with pride! Happy to have got my team kit! Update from across the pond! I write this from my condo in Winter Park, Colorado on a day off from skiing. I flew out after Christmas and have been here for three weeks. I was due to take part in the Winter Park Open race just after new year but unfortunately the race I was doing was cancelled due to too much snow! It was a real shame but at least I have another one in three weeks time in Park City, Utah to focus on. We have had a lot of snow and consequently quite a few powder days which have been a blast. Powder skiing in a monoski, especially for me being an LW10-1 (which means little or no core strength), can be difficult and I recall this time last year when I really struggled in the powder. Happily, I am well able to ski it now, and can finally see what all the fuss is about! Now I'm counting down the weeks until my next race I'm hoping for less powder days as I want to get as much training in gates as I can so that I can perform well in the race. This week I spent two days at Aspen Seating down in Denver to get fitted for my new custom made sit ski seat which has been funded for me by the very generous Matt Hampson Foundation (http://matthampsonfoundation.org/) - a fantastic charity that supports people who are have been seriously injured. I was put onto the foundation by a Back Up colleague and friend of mine, Tim Farr who was a ski racer with the British Disabled Ski Team, and went to the Paralympics in Vancouver in 2010. He has been great in giving me advice about ski racing and I spoke to him about getting a new seat for my rig as it was something that I had been thinking about for a while and he suggested I get in touch with them. I contacted the foundation and the CEO arranged to meet me at the Snozone in Milton Keynes during a training session. I met with him after he'd watched me skiing and we spoke about my ambitions and about the custom seat I wanted to get. He told me that they would be happy to support me and to fund this seat. I was obviously thrilled and was really excited to come to America and get my new seat. I spent the first appointment getting a mould made for my seat where I basically sat in the shell seat which was filled with that stuff people stick flowers in. Then I was lifted out of it and Matt covered it with wet plaster strips which quickly dried. Once it was covered he lifted it out and it was a mould of my bum! I came back the following Friday and from that mould Matt had made the foam insert that goes into the shell which I sit on. I sat in this and it fitted like an absolute glove! Following this he attached the various straps that hold me in place on my thighs, hips and stomach. The next step was decide on the position of the backrest and to insert padding to make it fit me perfectly. I have slight scoliosis in my lower back so the lumbar section was padded so as to accommodate this. It definitely means that it would be pointless anyone stealing this expensive piece of it as it won't fit anyone but me! I must admit I was a little nervous about taking it out for the first time as I was so sure there would be things I wasn't happy with. I was instructed to take it easy for the first few runs, which I did, and I was pleasantly surprised that I could ski in it absolutely fine! It has some different features like a fixed back rather than an adjustable one, it's slightly higher due to more foam underneath me, and the backrest is shaped differently to my previous seat, but I was really pleased with the way it felt! It will take a bit of getting used to and possibly some adjustments (I need to go back to Aspen Seating to have my leg cover added next week anyway) but all in all, its a fantastic seat and I'm really pleased with it. A huge thank you to the Matt Hampson Foundation for funding it for me. I am so grateful! Will definitely get some pictures up on social media of the finished article when it's completed. My next race is in three weeks time so I'll be getting my head down and working hard on and off the slopes before then. Luckily Winter Park has a fantastic gym with great facilities which I've been using for workouts and recovery sessions after skiing. Today I've had a day off (and caught up with some much needed life admin!) but I'm looking forward to getting back on the hill tomorrow. A little while ago I was entered into the Heron Lake Championships - the home of the BDWWA (British Disabled Waterski and Wakeboard Association) and the place where I spend a lot of my time. I entered both the waterski and wakeboard competition, the first being in the 'advanced' category which I wasn't so convinced about, particularly as it involved skiing through the slalom course which I hadn't done much of before. Still, I figured, you have to start somewhere! The day had a fantastic atmosphere and it was great to see lots of people who go down there, some more than others, and to have some healthy competition. As there were lots of people to fit it, we only had 20 seconds each to demonstrate what we could do on a wakeboard and only slightly longer on the ski. I was pleased with my performance on the ski through the course, even managing to go round some of the buoys on the outer course, something I'd not managed previously. I think it must have been the 'give it all you've got' for twenty seconds that helped me out. Although my competition were stronger than me, with some great performances by David Wise and Mark Roffey (who hasn't skied in a few years so was very impressive). On the wakeboard, having recently managed to perform a 360 much to my delight, after doing a few smaller tricks like side slides, touching the water and grabbing the board mid air (harder than you think, mind you!) I decided spontaneously to give it my all and try a 360, once I'd gone round 180 degrees, a trick that would surely bring me to victory if I got it right! 180 degrees through a 360! My victory wasn't to be. I came off when trying to complete the spin and had to return to the dock in the 'boat of shame' as it's known. Not my proudest achievement. Still, my other tricks were good enough to give me second place and a very smart silver medal which I have hung proudly on my wall at home beside my Wings for Life finishers medal and another for a 10k I did a couple of years ago. With any luck it'll be accompanied my some IPCAS (International Paralympic Committee Alpine Skiing) medals before too long! I'm keeping up the waterskiing while the water isn't too baltic (won't be long!) and it's doing my snow skiing a lot of good too. Since then, besides work, I've been in Hintertux in Austria for a ten day training camp with the British ParaSnowsport Development Team. I had an absolutely brilliant time and was fortunate enough to have some days training one-to-one with one of the coaches whilst my teammate took the days off. I was working of developing my technique and carving the ski rather than skidding (which is something I'm guilty of) and it was amazing to see the improvements that had been made by the end. We skied in the mornings when the snow was best and before it got too soft and slushy, spending quite a lot of time working on technique whilst free skiing (not in gates) which I found really helpful and it gave me the opportunity to really work on getting rid of bad habits I've picked up like skidding the ski instead of carving properly. It was great to be taught by such a great coach with so much experience and expertise and I made some huge improvements throughout the week and by the end my skiing was looking much better and I was starting to carve more consistently. This will be great for racing as it'll mean I'm a lot faster as the ski will cut cleanly through and no speed will be scrubbed by skidding. Transferring this into skiing gates will be an interesting challenge! It was great to spend the week with the rest of the development team, they are a lovely bunch and are brilliant skiers who are all very supportive of the other team members and I really felt the team spirit. We laughed a hell of a lot during the camp, particularly at meal times when particular pranks and games were played, I'm not sure I've laughed as much in a long time! I can't wait until the slalom races at Landgraaf in November as it'll be lovely to be doing it as part of a team. Each morning we'd have a 6am start with activation once we were dressed, breakfast and then (a beautiful and very green) walk to the bubble lift for 8am to get on first (the wheelchair card definitely helped here for skipping queues!). After a few hours of skiing we'd head back down one bubble for lunch, then back to the hotel for recovery. We'd have a couple of hours to ourselves in the afternoon, then video analysis followed by a team meeting then dinner. I found the video analysis really helpful and it was good to do it everyday and feed what I'd learnt into my skiing. During our free time we'd invariably be tuning skis - having been almost a total novice in this area, I'm learning a lot and getting lots of practice! We skied for three days with a day off after that during which we focused on strength and conditioning. For me, we focused on lats and core strength, as that's pretty key for monoskiing so I'm trying activate what minimal core strength I have! It was fun to explore what stretches and exercises were possible and helpful. I've been instructed to try lots of sports for strength and conditioning, especially canoeing/kayaking which is very good for an upper body work out. I'll have to find a club and I'll update when I've given it a go! I've been back for a couple of weeks during which I've been waterskiing as much as possible (aware that it's nearing winter by which time it'll be too cold to hit the lake), working lots in the office, and I went to a friends wedding at the weekend which was really lovely (and really nice to catch up with friends). I'm back to Hintertux again on Saturday morning for ten days and can't wait! Alpincentre, Wittenburg - everything we needed, under one roof! Training with Team GB in a giant freezer! I’m writing this en route back from Hamburg where I’ve spent 6 days training with the British ParaSnowsport Development Squad. We drove from Hamburg to a small town called Wittenberg, which was home to a huge metal structure, which housed a large artificial ski slope. The hotel was on site so we didn’t strictly have any need to venture outdoors for the entire duration of the trip. During activation and recovery sessions I would take a couple of laps of the car park to get some oxygen in me! Activation in the gym, bright and early! We had a schedule for each day, mostly starting with activation before breakfast – the idea being that we work ourselves up to eating a decent breakfast. A good breakfast buffet was followed by getting on snow; a few warm up runs to start with and then either drills or taking turns to ski the slalom course. After a two-hour session we’d go to the gym for spinning and stretching. Lunch followed by a bit of free time to rest up which I definitely needed each day! Sometimes we’d have a video review before heading back out on snow for another two hours. After this we’d do spinning and stretching before a quick shower, team meeting, dinner and bed! We had a physio with us, which was really helpful to get some advice about how best to activate and stretch, particularly as it varies from person to person. Video analysis - all eyes on me! Because we were training indoors slalom training was on the cards. Slalom is a challenging discipline, particularly for monoskiers, because it means you need to make very quick turns, and this can be tough, especially for me, given my level of injury with absence of much core to speak of. One thing I had been told about the Alpincentre at Wittenburg was that it was a very icy run. The race lane is sprayed with water which makes it pretty icy – not easy to contend with! It was great to do some really focused drills and I found that I made some good improvements during the week. At the start I was struggling to even get down the slalom course, never mind make all the gates, and by the end I was getting down with more ease. That’s not to say it was a transformation – but a noticeable improvement! I still can’t wait to get in a Giant Slalom course again! 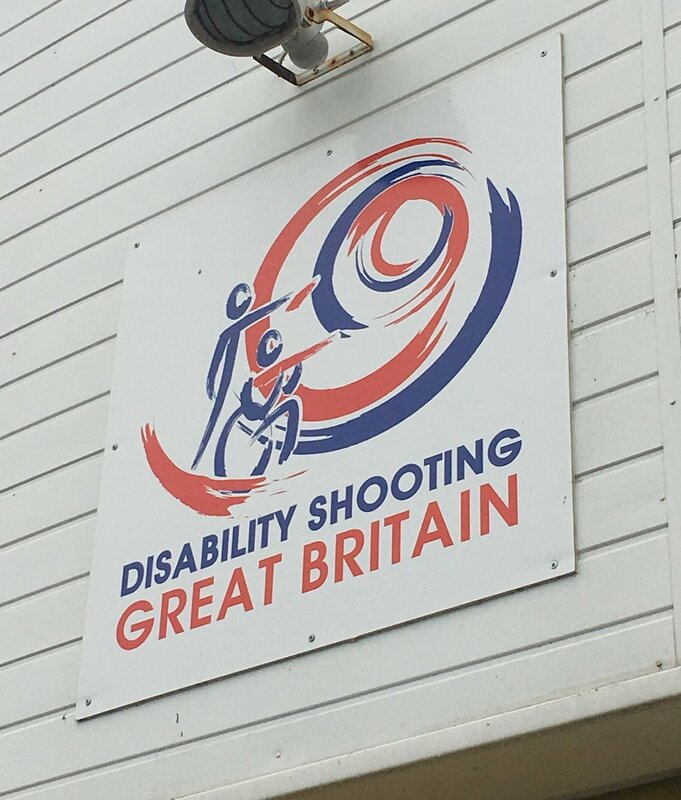 I spent the week with members of the GB development squad and team and felt very welcomed – they’re a lovely bunch and I came away feeling like part of the team. It was a brilliant but intense week (with a lot of german sausage – no pun intended), and despite it sometimes feeling surreal to essentially spend the week in a large freezer, I had a great time and made some good progress. I was pleased to get some good feedback and to be invited on some more training camps – I’ll be heading to Hintertux in Austria in two and a half weeks, and then back again two weeks later. I can’t wait to get some extended time training on snow with the team and the brilliant coaches. I was chuffed there was chairlifts - no drag lifts to deal with! Tomorrow I’m heading to Heron Lake to get my wakeboarding fill and then on Wednesday I’m up to Milton Keynes for a Pathways training day with some of the team. The BBC will be there filming a documentary of Sean Rose coaching us – should be fun! It’ll be interesting to see what difference the training camp has made when I’m back on a less icy course! First taste of ski success! A little while back I was invited to take part in a ski race alongside a day of training at Milton Keynes Snozone alongside my fellow GB Pathways teammates. I wasn't feeling on top form beforehand and had spent most of the week earlier in bed getting over a sore throat that wouldn't budge! I figured I may as well go down and at least get some practice runs in because it was going to be my last proper training day before heading off to Wittenberg, Germany for a British ParaSnowsports development training camp. So, popping the Paracetamol, I headed off to MK at the crack of dawn. I knew that I wanted to perform well so that I could go off to Germany feeling confident in my skiing. It was quite a long day, with the racing only starting at about 5pm! But with experience, I'm pretty self-aware about my limits and know that when I start to get tired, its time to break, or call it a day. We practiced slalom in the morning, then I took an extended break around lunchtime (with plenty of coffee, painkillers and energy snacks!) and hit the slopes again a little later few a few warm up runs where the course would be set. It was a shorter course that it usually would be in an IPC event so we took four runs rather than the usual two. I was pleased to have some good competition in Amber and Shona, particularly, as some classes didn't have as many competitors. We finished up, had the mandatory cup of tea (still trying to ease that pesky sore throat!) and waited for the results to be ratified upstairs in the bar area. There were lots of competitors; on the ParaSnowsport side: visually impaired skiers & guides, sit-skiers, standing (all with both men & women's categories); and lots of able bodied competitors too. I knew I'd get a place because there were 3 competitors but wasn't sure where. When it was announced that I'd got first place I was pretty surprised. Both my competitors had put down some really good runs! But I was, of course, really pleased (as you can see from the huge smile on my face) and it has certainly boosted my confidence for Wittenberg. I leave for Wittenberg next Friday where I will spend a week training with the British ParaSnowsports Pathways and Development Team & coaches. It's in an indoor artificial slope but is far longer than the ones we have here in the UK. The focus will be on slalom, which although is not my favourite discipline (I much prefer getting a bit of speed up in GS), it'll be really beneficial as it's my weakest discipline too. I look forward to getting a whole lot of practice in and then hopefully being able to put down a decent race when it comes to it later in the year. This camp will be the first of a few this year. The next will be in Hintertux in Austria in September where we'll be on a glacier. Following that, more training in Wittenberg, races in Landgraaf in Holland and then off to Winter Park again after Christmas for more races and lots of practice. It's looking to be a good and busy season! Hello there! I've had a great few weeks, been very busy, but have really enjoyed doing all sorts. Starting a couple of weeks ago with a visit to the school of a six year old girl who has had a spinal cord injury and is now a wheelchair user. This is part of my volunteer role as Back Up School's Advocate which I was trained for last year. It was my first time being active in this role, having been away in America, but I was really excited to start out. I prepared a presentation in which I explained (in a light hearted way; suitable for their young age) about the spinal cord, how it can be injured and what the side effects can be. I wanted to get across that it can be very hard for all involved when it happens, but that life can still be lived to the fullest. After explaining the facts and using an activity to demonstrate a spinal cord injury, I told them my story, illustrated by pictures of some of my adventures. The children responded really well and asked some sensible and thoughtful questions despite only being in year one! 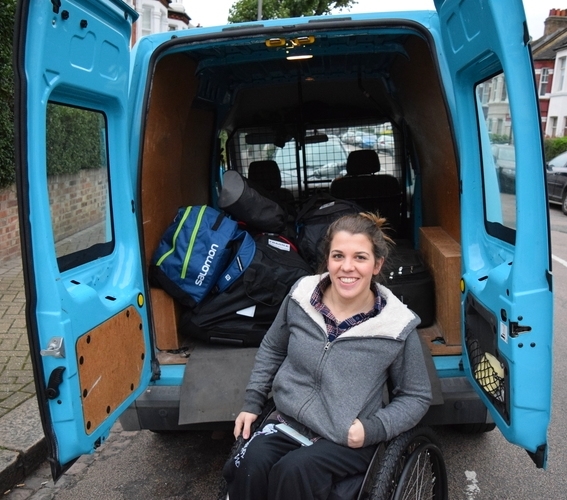 The girl with the spinal cord injury struck me as very determined and I have little doubt that their injury will stop them getting where she wants to in life. I finished off the presentation by reading out a poem that one of my colleagues wrote when she was ten years old after she'd had a spinal cord injury. I really like it and think its pretty inspiring; particularly given how young she was. I also went on the first Access Adventures waterski camp of the summer which was brilliant. There were a few people I knew that hadn't tried waterskiing before who came down and well and truly got the bug! It definitely has that effect on people and it was really inspiring to see how much people were enjoying it and making some good progress. I've now started wakeboarding which I am loving - my next challenge is to nail a 360! Alongside working and wakeboarding I've had a few training sessions up at Snozone in Milton Keynes with the Pathways team of ParaSnowsportGB. We've been practicing slalom because the run is too short to do anything longer and although I find it the most challenging due by my level of injury - T3/4, because my lack of core makes it harder to turn more quickly, I'm finding it really helpful and can't wait to get back on real snow to see a real improvement. On Saturday Sean Rose (Paralympian, TV pundit and all-round superstar) came to give us some coaching which was brilliant and really helpful. As well as being pretty inspiring to watch the speed with which he took the course! A few weeks ago me and some friends took part in an amazing event called the Wings for Life World Run. Wings for Life is a charity that was started up by the founder of Red Bull, Dietrich Mateschitz and his close friend and two-time motocross world champion, Heinz Kinigadner who's son was involved in a motorcycle accident which left him tetraplegic. On realising that research into finding a cure for spinal cord injury is underfunded due to the relatively small number of people who sustain such injuries, but that finding a cure is a realistic possibility due to the research that has been done so far; the two set up the Wings for Life research foundation, with the aim of finding a cure for spinal cord injury. The foundation remains the sole charity supported by Red Bull. The Wings for Life World Run is an event that takes place all over the world in 34 locations, including Australia, Japan, Brazil and Russia, all starting at the same time (12pm in the UK happily for us!). 30 minutes after the runners start, the Catcher Car sets off at 15km/hour, getting faster each hour. If the catcher car catches up with you you have to stop. This year 130,732 runners took part, raising over £5million to go towards finding a cure for spinal cord injury! I took part with three friends and I knew quite a lot of others taking part in wheelchairs too, not surprising really, given the cause. The atmosphere was absolutely amazing, throughout the whole run there were supporters on the side lines cheering us on, spraying us with water (it got up to 27 degrees that day!) and giving us drinks. It was such a support having people shouting our names the whole way and made the hot weather all the more bearable. Whilst on the run I caught up with my friend Laurie and we pushed together for a while before we were caught by the catcher car which was being driven by David Coulthard! So although I was pretty gutted not to have got further before getting caught it was a good consolation to have got a high five from him! The event was an awesome thing to be part of and we all vowed that we'll do it again next year. It is such a fantastic charity and great cause - I'm pretty determined to raise as much as possible next year as well as getting a bit further before being caught by the car. It was a little spontaneous this year so I didn't have many practice runs but next year, helped by my ski training, I'd like to try and hit the half marathon mark! Watch this space! Back in Blighty with summer on the way! After returning to the UK at the end of March, it now feels as though I've been back for ages and am well and truly settled back into London life. Not long after recovering from travelling (not only back to London but having flown to Boston and back for US Nationals a matter of days before) I gained and started working at Back Up in their office, as Outreach and Support Coordinator. Since then I've been busy travelling up and down to Sheffield and Pinderfields spinal units where we've been running various sessions for newly injured patients. I got back last night from one in Sheffield called Join the Dots where a group of inpatients, hospital staff, myself and two wheelchair skills trainers go around the city, practicing different skills, to help with the different challenges you face every day in a wheelchair such as going up and down curbs. Yesterday one brave inpatient even followed the skills trainer's lead as he ventured up an escalator! Not without a nurse closely behind him though! Now that the sun is showing its face again I've started regularly going back to Heron Lake to waterski. I did earlier in April but got very cold, (it has taught me something about the side effects my disability and my inability to regulate temperature - not much fun!) so having bought a thicker 'triathlon' wetsuit for myself, I am much happier in the water! I'm making some good progress, with the help of a 'delgar' strap that keeps my legs and body more forwards and stable, which helps me get up onto the water more easily. I'm now using the Bushey ski which is narrower and therefore more twitchy in the water, more difficult, but a lot of fun. I've been practicing going through the 'slalom course' where you have to go round the buoys that are set out. Its definitely good practice for slalom in snow skiing! Although you have to lean in to make a turn (which is effectively the opposite to snow skiing), it still works your body and any core I have, in a way that other sports don't! Despite the struggle to get in and out of a wetsuit when you can't move your legs (wouldn't recommend it!) waterskiing is so much fun and I can't get enough! I'm looking forward to some sunny days down there this summer. It's a great place to just hang out. I'm looking forward to an Access Adventures camp (accessadventures.co.uk) next weekend with some friends some of whom will be trying it out for the first time. It'll be a busy weekend as I'm going up to the Snozone in Milton Keynes for some ski race training with ParaSnowsportGB on Saturday morning, leaving at 5.15am! As I write this I am on the plane from London to Denver I am feeling pretty jammy as I managed to get an upgrade to business class (thanks British Airways!). As it’s a 10 hour flight it is a very welcome relief and is much more comfortable. I didn’t get the menu, but I think they gave me the one up from economy, which tasted fine. I’m pretty used to long-haul flights now so I know what to expect and what I’ll need on board, etc. I see it as a nice time to get away from social media, emails and my phone and to watch some movies, read a book and now; do some writing. Last season (2014/15) I spent the winter in Winter Park, Colorado (winterparkresort.com) with the view to becoming an independent and confident sit-skier. I spent several months skiing the mountain with an instructor in order to get my skiing up to scratch. I was determined not to start race training before I was completely confident in my skiing ability. Once I started training with the other athletes at the NSCD (National Sports Center for the Disabled; nscd.org) I totally got the 'bug' for skiing gates. It is far from easy but I think that is part of the reason it's so exhilarating when you get it right! I am now returning to Winter Park for the season because I want to take my skiing to the next level and start racing. Here, I will be able to ski nearly every day, and this will give me the best chance of significantly improving my skiing. This season I am going to be documenting my experiences more than just on Instagram and Facebook. Last season was definitely a journey and this time I want to share it. I had a great summer, I came back from my season to go straight into school (which was a bit of a shock to the system!) to finish off my teacher training which, gladly, I successfully completed. Following that I had a busy summer, starting with climbing Mount Snowdon with a team of about 12 in the Back Up Push, a fundraising event for a charity very close to my heart, who support people with spinal cord injuries. It was an amazing experience and I was so proud of our team for completing it in an incredible time and coming second out of 13 teams (not a race?! No chance! ), and contributing to a massive total raised for Back Up (backuptrust.org.uk). Over the summer I did quite a bit of water skiing, starting with a couple of camps with Access Adventures (accessadventures.co.uk), which were a lot of fun. After getting the hang of it I went to Heron Lake (bdwsa.org) quite regularly which meant that I was able to make some good progress! By the end I was skiing in the slalom course which I also found really helpful for my skiing. Once the winter is over I will definitely pick up the water skiing again and see where it takes me. I kept skiing over the summer at The Snow Centre (thesnowcentre.com) in Hemel Hempstead which, although is a very different scene from the snowy climbs of Colorado, (a very short run, button lift, artificial snow), should mean that I will be able to pick up from more or less where I left my skiing in April which will be good. Hemel Hempstead isn’t the only unlikely place I’ve skied recently. Last month I went out to Landgraaf in Holland to get classified and also to train with the GB team. It was a long drive, which is, as I am learning, part and parcel of ski racing. Being classified was an interesting experience where my balance and core strength was tested through different ways, including, a very wobbly balance board! As the level of my injury is T3/4 (which is at chest level) my balance isn’t very good and I don’t have much core and this was confirmed when they were unable to identify any working stomach muscles when asking me to attempt sit up style exercises. The balance board was an interesting experience as I was unable to perform many of the tasks, despite my best efforts! They asked me to leave the room while they discussed my classification and, when I returned, they informed me that I would be classified as LW10-1 which is the highest level of impairment for sit-skiing. I am pleased with the result and it should provide me with a level playing field in races. Whilst in Landgraaf I met with the coaching staff and team who were friendly and welcoming. The following two days were spent training which meant early starts (5.30am alarm for ‘activation’ at 6.30am – this was a warm up to ‘activate’ the body and prepare it so that breakfast could be used as fuel more effectively) and onto snow at 8am. This took place at Snowworld (snowworld.com) which has a 500m long run and a chairlift – a welcome break from Hemel Hempstead! It was great having 500m to practice on as it gave us a chance to get more turns in and therefore more practice. The run was quite shallow but the snow was groomed and the conditions were okay, particularly early on, and I was happy with my skiing during training with the coach. We skied for about four hours, starting with some warm up runs, then doing drills and eventually working on making smaller turns. There was a slalom course set up for a race the following day, which I had a go in too. I managed it okay but slalom tends to be a bit of a nemesis for skiers with higher-level injuries because you have to make much quicker and shorter turns than in other disciplines and this is difficult without use of the core (and I am no exception). I also haven’t had much experience skiing slalom yet but this season I should make some good progress. So I’ve got 1hr 23 to go till I land where it’ll be 7 hours behind the UK. I’ll get picked up at Denver airport by one of the coaches who’ll take me to my condo in Winter Park town which I’m renting for the season. I’ll make a stab at unpacking and probably fall into bed before long! Update 6.12.15: I've now arrived at Winter Park. Above is my view each morning from outside my condo (on the right). The photo doesn't really do it justice but it's awesome to be able to see the mountains when I go outside each day. I've been out skiing twice now and am pretty happy with my standard given that I haven't skied on proper snow since April. I'll get a video up here soon. There's been quite a bit of snow too (26 inches at the base; see winterparkresort.com/the-mountain/snow-weather-report.aspx for the weather report) and it looks like more is on the way which hopefully means it'll be a good season.